Following a positive evaluation and prior to the development of a possible second phase, the Building Change Trust would like to take this opportunity to reiterate and clarify the role and purpose of Inspiring Impact in Northern Ireland. 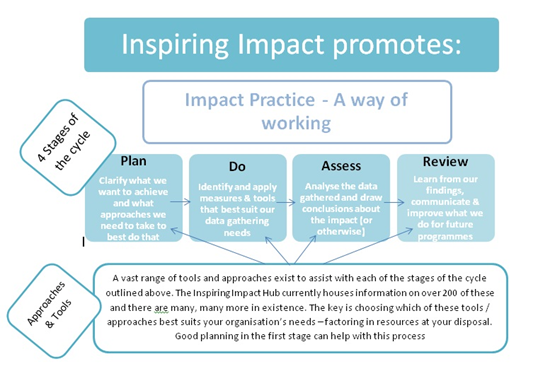 Developed by a collaboration of bodies from across the UK representing the VCSE sector, funders and measurement practitioners, Inspiring Impact is a movement which promotes and encourages impact practice as an organisational wide approach. Inspiring Impact in both Great Britain and Northern Ireland has developed and disseminated resources and aids to the sector and carried out support work directly with organisations. All of our resources and support to the sector have been made available free of charge. Inspiring Impact is about promoting and supporting good Impact Practice – a way of working that can help change organisational culture so that charities and their funders become more focused on the impact of their work and build practice and systems that will support them become more effective at demonstrating the difference they make. Impact Practice is defined as the activities that an organisation does to focus on its impact. This can include planning the desired impact, identifying how to measure it, collecting measurement data, making sense of that information, then learning from it and communicating results. An online self-assessment diagnostic “Measuring Up” to help organisations and funders reflect on their current impact practice and plan what they need to do to improve it. These are built around and advocate a cycle of impact practice summarised in four stages: Plan – Do – Assess – Review (outlined in the diagram below) and lay the foundation for the identification and application of appropriate tools, a number of which are being successfully applied in Northern Ireland and elsewhere – OBA, SROI, Social Value Framework, Measuring Change, Social Impact Tracker etc. The Inspiring Impact NI programme was developed by a coalition of VCSE organisations and funders. A recent external evaluation has found that ‘the IINI programme has been a timely and relevant intervention which has been well planned and well executed. It has engaged a significant cohort of VCSE delivery partners as well as public sector funders to engage with and plan for the implementation of a new approach: impact practice’.